Peter White was appointed Town Crier of Seaford having cried for the Queen’s Silver Jubilee in 1977. 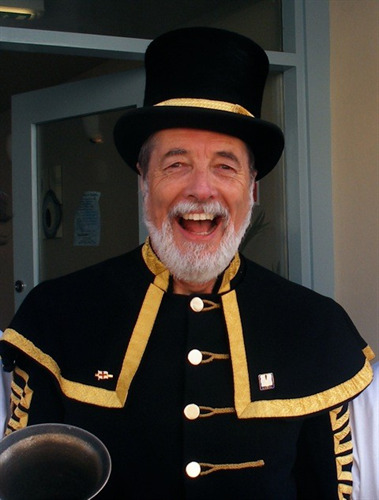 He is one of the longest serving Town Criers in the country. In 1980 he joined The Ancient and Honourable Guild of Town Criers. In 1982 he was appointed Stadtausrufer to Bönningstedt, which became twinned with Seaford two years later. In 2002 he was made Town Crier of Crivitz, Bönningstedt’s German twin. As such he has been asked to cry in Bönningstedt, Hamburg and the former East Germany; as well as taking part in events in Paris and on a Channel ferry! He assisted in the opening of BBC Radio Sussex and won TV’s Surprise Chefs with Kevin Woodford, beating two other Criers. In Seaford he is usually employed calling supporters to fetes, concerts and civic events. He has welcomed Father Christmas in his sleigh, conducted foreign students around historic Seaford, led brides to the alter and driven shoppers to distraction! His calling is based upon historical fact, and his uniform is based on that worn by Town Sergeant and Mace Bearer William Woolgar in late Victorian years. William Woolgar served the ancient Corporation of Seaford. During Peter’s period of office he has officiated at the opening of Seaford Museum, foundation laying at the Barn Theatre and welcomed the new Seaford Town Council. Crier brings home the Trophies -- Again! Peter White, Town Crier of Seaford for nearly 40 years, has brought home the silverware again! Peter, appointed to the post in 1977, returned from a weekend in the West Country with two Runner-Up prizes to his name. In the Yeovil Town Council contest he came 2nd in a line-up of 23 Criers for the two best 'Cries'. At Blandford Forum's Georgian Fayre he carried off the Runner-Up Trophy in the South of England Championship. Having taken 2nd place in 2015, Peter returned home to Seaford with the same prize shield for a second year running. Slightly less glamorous, he was Sussex Champion in 2015, and has held the Essex title since it was last contested in 1994! Peter has been Seaford's Town Crier since the 1977 Jubilee, and the Serjeant at Mace for Seaford since 2012. In 1982 he was also appointed Stadtausrufer of Twin Town Bönningstedt. His unique uniform made by the Queen's Naval Uniform Maker is a frequent sight in Seaford's Broad Street. A long-time supporter of the RNLI, Peter is hoping to run a Seahaven Town Crier Contest in aid of the Lifeboats at historic Newhaven Fort on 16th October, involving many of the international Criers attending the National Championship at Hastings the day before. This fund-raising event will be co-supported by Jon Borthwick, Town Crier of Peacehaven and a frequent Herald of Lewes events. 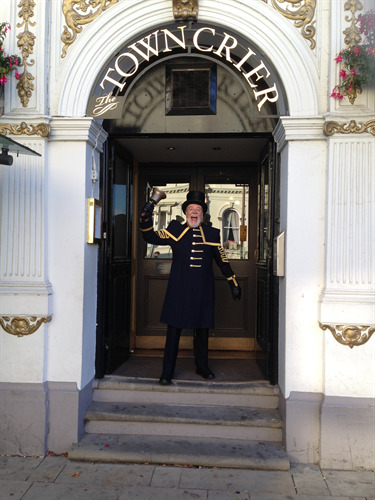 Peter returned from the Chester World Town Crier Tournament in 2014 clutching a trophy! Peter had not expected to win in a contest with 24 other Criers including a number of World Champions. True to his expectation he was not placed in the top 10 of this 10-nationality competition. However, two sharp-eyed costume judges noticed the military cut and classic lines of his 1865-replica uniform, crafted by the Queen's Warranted Naval Uniform Tailor Geoffrey Golding. And he was placed second overall. Said Peter: "To win second place was a great honour. The winner, a Native American from Canada, had three different brilliant outfits and deserved to win!" It is also a big thank-you for the Clubs and individuals who helped to fund the new uniform two years ago. Peter was presented to the Lord Mayor of Chester, who actually knows Seaford well. Peter presented him with an inscribed and sealed parchment greeting from the Mayor of Seaford, and his own personal gift: a stick of Seaford Rock! All the Criers volunteered for an afternoon of community work, and Peter spent his time in Chester's Central Library reading stories to children in their holiday reading club. Picture: (top) Peter White, Town Crier; (bottom) Peter in action at the Chester World Town Crier Tournament.